While this topic may be a departure from the normal fare for a typical Monday here at the Gazette, I felt that it was something I really wanted to talk about, if only for a few minutes. The Topic I am speaking of is the very community that you and I are all a part of, this Disney Community, namely the Online Community. I can hardly believe that just a little over a year ago I had no idea that it even existed. I sat in my little “bubble” thinking that I was really alone in my passion and love of all things Disney. Now, I fully realize that Disney has a huge fan base, but I never thought about how personal it all is and how there could be sure incredible ties between others and myself who felt the same way about these things that I hold so dear to my heart. As many, if not all, of you know, I have long been a fan of and a visitor to, Walt Disney World. Growing up I knew a few others who had visited The World, but certainly no one who went as often as my family did. 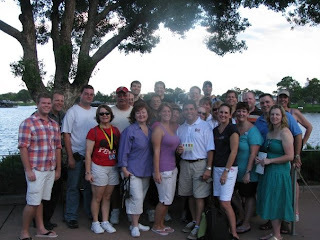 I know I was lucky to have parents who made these trips possible for us, but just assumed that since I had never met anyone else who did this sort of thing, that I was among the “few and far between” ranks of Disney World fans…OH WAS I WRONG!!! Just about a year and a half ago, through the purchase of a new iPod, I stumbled upon a few Disney Podcasts, with that discovery…it was ON. It quickly snowballed into more than a dozen podcasts, a dozen more websites and endless blogs. While this was all a lot of fun, the whole thing really became “real” when I visited a WDW Radio Meet of the Month, which was held by Lou Mongello. I met a lot of great people at that meet, some I had spoken with online once or twice and others I had never met before. I had an amazing time that day, for the first time in my life I had met others who truly had the same interests and passions that I have possessed since I was a little boy. Once again I found myself a part of the “snowball” effect. That little meet led to more time talking online with my new friends and wanting to very much be a part of it all. My wife, Charlene and I volunteered to help out at “Wrapping Weekend” at Pat Whitson’s house, preparing baskets for the Dream Team Project Auction which is held every year at Magic Meets Fan Gatherings in Pennsylvania…that was the moment at which many of these online acquaintances quickly skipped 5 levels of friendship and became a second family to me. From there we went on to Magic Meets, where we spent the weekend becoming closer and learning more about one another and so on and so on. I could really talk for hours about how this all came about and how each of these people went from being friends online to being friends in my heart. Since then, I have been luck enough to make several trips to Walt Disney World, during which I spent time with this new family while also meeting many new faces and welcoming many more new friends into my life. I have also been blessed enough to have been invited to join some of these friends for trips and weekends away, even outside of the “Disney Spectrum”, just great friends, spending great times together. The purpose of this article was not intended to tell my “life story” in the Disney Online Community, but instead to offer some real PERSPECTIVE on what this all means to me. The past few months have been busy ones for many of us who call this community home. Some have lost family members, some have gained them, some have fallen on hard times and others have been there to help. Through all of these times, I feel like my love for my friends has grown exponentially. It seems like so many people I did not even know existed a year ago have staked their claim in my heart and my life and for this I am truly grateful. This is the meaning of Community for me, and for those out there who are looking in on the goings on here, I offer an invitation to come in and get to know everyone. There are so many wonderful people in my newfound family, people who will be there for years to come. To Ryan, Lori, Lou, Deanna, Pat, Bryan, Beci, Ray, Glenn, Greg, April, Fred, Mike, Mary Jo, Val, Steve, Tracy and so many more that I could go on forever, as well as the new friends who I may not have met yet, but are out there waiting…I thank YOU for giving ME a bit of Perspective on what this all means. I look forward to more good times ahead, because that is what the real meaning of the Disney Community is to me. Aw, shucks ya big lug. We love ya, too! (Much as I love Beaches & Cream or Soarin', and not the "pick out curtains" way). Seriously, my family and I are blessed to have gotten to know YOUR family, and appreciate the memories you have helped create in the short time we've known each other. You're all a great addition to our extended family, and we look forward to the fun times ahead! Tony, you are absolutely right. The Disney "virtual" community is an amazing experience. From there, we also get together to meet. I met you at MagicMeets last summer, and got to follow that up at the WDW Radio Food and Wine Festival walkaround of World Showcase. Such fun to meet other fellow Disney enthusiasts. You hit it right on the head, Tony. And made me cry. Again. For me, it's not just the fact that there are so many Disney fans out there, it's the fact that there are so many GOOD people out there! That's something that had been getting lost in our suburban jungle here, and on the nightly "let's tell you all the bad stuff" news programs. Many of those names you mentioned have gone a long way towards restoring my Faith, Trust, and Pixie Dust.